Perhaps no other venue defines the term "audio icon" better than the Hollywood Bowl. With its arched, shell-shaped amphitheater, the 1920s-era Bowl is home to the Hollywood Bowl Orchestra, the Los Angeles Philharmonic in summer, and hosts hundreds of musical events each year. 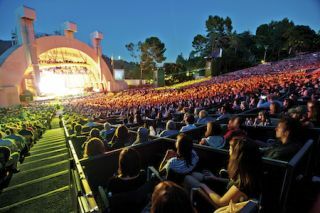 Los Angeles' Hollywood Bowl outdoor amphitheater features an L-Acoustics K1 loudspeaker system, controlled by a DiGiCo SD7 and Yamaha PM5D consoles. In the fall of 2012, the Bowl underwent what Master Audio Michael Sheppard prefers to call an upgrade. An L-Acoustics V-DOSC system, leased for several years through a third-party vendor, was replaced by an L-Acoustics K1 speaker system. Sheppard and his crew tested several systems, including the newly minted K1, the winner in a blind test. They were all high quality speaker systems, he explained, but the Bowl is unique in shape and size. With a capacity of more than 17,000, making it one of the largest outdoor concert venues (excluding stadiums and outdoor arenas), a unique shape, and the close proximity of neighborhoods, there were myriad considerations, including restrictions on sound pressure at property lines. The system is put into hibernation around Halloween in a climate-controlled space off stage, reappearing for install just before Easter. The system also features a DigiCo SD7 and a Yamaha PM5D for FOH and a DigiCo SD7 and Yamaha CL 5 for monitors. Karen Mitchell is a freelance writer based in Boulder, Colorado.